For last year’s resolution, I was filled with “big ideas” encompassed by TRYING. Some of them were successful; others need work and are still on my focus list for 2019. And, speaking of “focus”, that might just be my word for the new year; FOCUS. Focus, mindfulness, awareness. Whatever it’s called, it’s a positive driving force for the new year. It’s not to say that 2018 was a complete disaster; far from it. Sitting on the edge of my son’s bed as we discussed the past year and what’s to come, he showed concern and his trademark anxiousness that “last year couldn’t have been better, how can 2019 beat it?” And I totally get that. Like many of us who read the headlines and take an emotional beating from them everyday, it’s hard to separate the outward realities from our personal experiences. However, sometimes for the sake of self preservation, the overall struggles of being the person your children need you to be, and a pure need to “keep calm and carry on”, it’s necessary. So, when I’m able to ignore the shadow cast upon it all, our 2018 was amazing. We had challenges that showed us how strong we are and the fact that we can show up when necessary. My husband, the baby, and I all dealt with huge dietary changes and, while it hasn’t really gotten easier, we’re still going strong. Things could have been so much worse (and, admittedly, I’m trying not to have that feeling of impending doom that the other shoe will drop). We also had to allow ourselves some leeway in the fact that we HAVE THREE KIDS. Big house jobs fell to the wayside and some days survival was the ultimate goal. I have a slew of outdated blog posts sitting in my Google Drive that will never see the light of day. Other days, we prioritized and did “enough” to fill our buckets and give joyful memories to the whole family. It was a year that we teeter-tottered and allowed ourselves wins and grace-filled non-failures – because, as always, our objective was the kids. I’m pretty sure we were successful in that, at least. One thing at a time. Sharing…but not sharing too much. While there are times that we simply have to multitask, I have read that the human mind simply isn’t meant to work at its best capacity when stretched in several different directions. I can hardly finish a single book because I have so many started. I don’t feel like conversations are conversations, but merely punctuation marks between social media check-ins and kid interruptions (okay, so THAT won’t be changing, but the other stuff can). For example, social media is a wonderful thing, but we’ve noticed (as have countless others) that the negatives far outweigh the positives. Anxiety, time sucked away from loved ones, a poor use of time, and just all the hatred and negativity. The list goes on. If it’s not improving our lives, there’s no reason for it. Dave and I will most likely be trying a social media blackout at some point (which is harder for him since he needs to access it for work, but as a nursing mom, social media is my much needed escape when nursing or pumping), but overall plan on just setting some guidelines about when/how much we’ll check in, and how much we’ll be exposing the kids without their say-so. Overall, the goal is to simplify. One book at a time. One screen at a time. One conversation at a time. One task on my to-do list at a time. Bam. Making the house a home with a place for everything. I’m hoping to get back to a modified Konmari method of purging in order to truly touch everything in the house. That’s. A lot. Of. Crap. I’ve heard that simplifying in this way allows us more mental and physical energy to for other activities and areas of focus. The fact that we’ll have fewer things to care for (to wash, fold, and put away or to give us mental static or to subconsciously stress us out) will hopefully lighten our mental loads. And at the same time, since I feel like some of our household duties fell to the wayside with a needy infant around in the past year, I’m kind of chomping at the bit to pay more attention to our outside space and finish up a couple of indoor spaces that are in dire need. In other words, starting to putter more and make a concerted effort to paint our room, work on the basement, focus on our gardens, and buy a shed. Last year, I hoped to achieve one big thing a month. It clearly backfired. This year, I’m reworking the list, analyzing what we actually need/want to do and WHEN would be a good time for each job (say, inside makeovers in the winter and outside work in the summer…duh, Meg) then assigning it a time. Journaling. I originally didn’t plan on starting this immediately since I had hoped to pick out a journal with daily focus (I’m not always great at just jotting down the goings-on each day), but because we’re starting the year off with a “No-Spend January,” I found a perfectly beautiful and totally unused notebook to start jotting down thoughts here and there. I think there’s more of a self awareness when you journal. And, of course, you (and your relatives) can look back at that specific snapshot of time in your life in a very unique way. Just love it and the intentions within it. Seeking energy. I hate to use the word “exercise”, but I definitely know I need to get more active in order to find more energy. I’ve become motivated by an influencer I love who suggests simply finding ONE active activity to do that brings joy. If you like walking, walk. If you like running, run. If you like dancing, dance. Then do it more. Before you know it, you’re motivated enough to seek other, more structured ways to get that adrenaline high. Making family time a priority. We already have a family movie night date each week (that floats from Friday to Saturday or even Sunday, depending on the schedule), but we’ve told the kids we hope to start a family game night. Then, what does our oldest come up with? A DAILY schedule of things to do. Batman night. Monkees night. Screen-free night. I mean, it’s incredibly well-thought out. While I don’t know if we’ll necessarily be able to do them all every day so structured, the idea is awesome…and a little tiring. But, I think that the investment of time in family is the best investment we can make. Oh, and we have a couple of family resolutions involving swim and dance classes, so we’ll see how that all pans out. Continue on the path to self care (and daily discomforts). As I mentioned earlier, I chose to include self care and continue on my #dailydiscomforts sharing (I didn’t share them daily, but whether big or small, they were there). Sometimes the daily discomforts find you in challenges at work or at home that pop up and need you to face head-on; other times we seek them out by doing a social activity that might be good for us (rather than hunkering down at home) or cleaning something we’d rather not be cleaning. Things like that. I like the thought that, as a friend and I were recently discussing, life isn’t meant to be perfect harmony and happiness every second of everyday. To have a little discourse added to your day helps you to appreciate the good and become better able to deal with the not-so-good. Hadman – His resolution is threefold: to learn how to swim, make it across the monkey bars, and treat his sisters more thoughtfully. The swimming thing gives us both anxiety but I greatly admire his focus. HQ – She says she’s “looking forward to trying new things.” I can’t wait to see what 2019 brings for our smart, forward-thinking sweetie. She’s very interested in trying ballet, and we also plan on potty training. Squish – I assume she’ll continue on her fabulous, full-steam-ahead path in her constant quest to keep up with the big kids. She’s a fun-seeking missile. That said…girl has got to get on a better sleep schedule. I’d love to hear what your intentions are for the year. If you don’t set resolutions or goals, how do you assess what areas you need to work on? Let’s chat in the comments! Not very long ago, I lamented our lackluster summer. Well, with recent trips to the zoo and our luck at attempting a beach adventure (on a day when 90 degree weather called for a summer activity rather than the previously planned harvest festival), I can officially say…Mission Summer: Complete and I’M TIRED. I’ll translate that. Our busiest time of year, like many families, fears up during the entire month of September (or whenever your school year begins), then kind of ebbs and flows until the next high tide at the holiday season. So, when I say that I (and we) are tired? That’s fall, baby. While the weather is only just beginning to loosen its grip on the thermometer, I am actually more than ready to pull out my leggings, puffy vest, scarf, and boots, and snuggle up with some almond milk cocoa, a roaring fire, a good book, and a cat or two. Yup, I’m a walking cliche. To paraphrase Captain Kirk, “Hygge me up, Scotty.” It helps counterbalance those nights that are heavy on the activities. 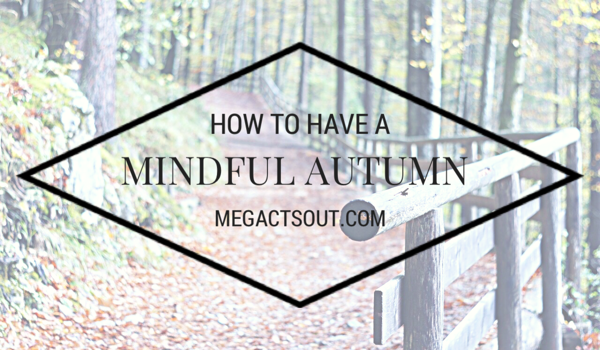 So, just as we made the best of the summer (and didn’t stress stretching our plans a bit in one direction or another – or scrapping them altogether), we don’t have to over-plan or try very hard to make the autumn a special season. We have things that we’d like to achieve, like our recent comic book convention and visiting with friends who came into town for it, and fall festivals and family nights sponsored at our local school and library, but it’s more about the simple experiences that we undertake during autumn that matter the most. I’m hoping that we can be present and enjoy those moments and activities in a more mindful matter. What’s your favorite sight to view when the weather turns? If you’re like me (a total walking cliche…), it’s the changing colors. Bright rusty reds, mustardy yellows, cheerful oranges…it’s our favorite season for this very reason. Our favorite way to celebrate our locale is with a road trip to Cooperstown. The rolling hills show off like crazy and it brings me back to my childhood. Walking our neighborhood will hopefully bring about the same effect, as well, and giving the kids a simple sensory nature walk scavenger hunt (find an orange leaf, a red cardinal, etc) will help them notice more of the world around them. And even shouting out different fall-themed things to look for – a scarecrow, corn stalks, a happy jack o’lantern, a ghost decoration, and so forth – adds to the fun. My absolute favorite sense is smell. I’m one of those people who gets easily transported to another place and time with the whiff of a simple scent. So, this is SUPER important to me for making memories. That said, lighting an apple candle, baking some pumpkin muffins, lighting one last chilly night fire in the backyard, and savoring the crisp, sweet smell of decaying leaves will hopefully achieve this goal. Oh, and popcorn. That’s a must in every season, but only when it’s lovingly prepared by my husband. This is a slightly more challenging sense with the dietary restrictions in our family, but I’m more than up to the challenge. I can’t have apples (what baby is allergic, I ask you?! ), but a dairy-free pumpkin treat like muffins will work in a pinch. Non-dairy buttery popcorn, again, is a must, along with almond milk hot chocolate. Spiced teas and flavored coffees help warm us up, too. And don’t forget the comfort meals! Chili, stews, and a good roast will fill our bellies (and help the husband feel less deprived, too). This may be a tough one, as well, but I’d like to pose this challenge to the kids. On cooler days, we can feel the chill on our faces and fingers. We can feel the warmth and coziness of a fluffy blanket. We can feel the cold, gooey insides of a perfectly-picked pumpkin or the crunchy leaves after a perfectly timed jump. And, oftentimes, this word has a dual meaning (especially for kids), so asking how they feel when we’re doing different activities (like walking through a corn maze or riding on a hay wagon) will inevitably help them become more emotionally aware, and attach to the moments they appreciate. Ahh, sound. It’s a great way to calm and quiet your mind by closing your eyes to focus on the world around you. Whether it’s listening to the gentle tapping of a fall rain storm, a fun spooky old radio show (we go between this and old ‘40s music, which somehow seems more appropriate on those dark, dreary days), the pop-pop-pop of popcorn shooting out of the maker, or the crunching leaves as you take a walk on a cool evening, there are plenty of ways to enjoy autumn sounds. Of course, our absolute favorite sound is the boisterous laughter of our kids enjoying the moment, no matter through what sense. I’d love to hear what you’re looking forward to most about autumn, and which sense is your favorite for experiencing life! Drop me a line below or stop by my Instagram account (@megactsout) to join in the conversation!